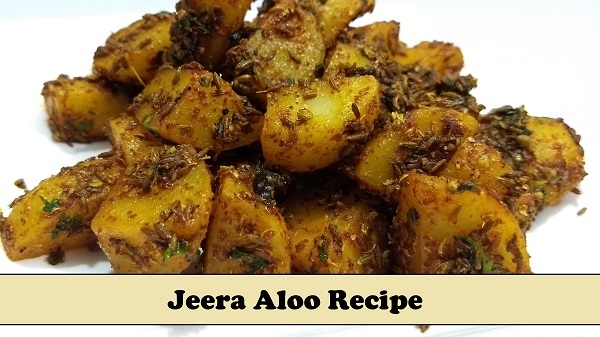 Easiest, Quick and Delectable Jeera Aloo Recipe in 10 minutes. Boiled Potatoes cooked with Spices, this dish is a treat for Potato lovers like me. The best part is, it gets ready in just 10 minutes so if you are in a hurry to make a meal, try this quick Aloo Jeera Sabzi. Serve with Roti, Puri or bread as a side dish. Learn how to make Aloo Jeera Recipe at home with this step-by-step guide. Boil 3 medium size Potatoes and cut them into cubes. Coarsely grind Fennel Seeds, Coriander Seeds and Black Peppercorns in Hand Grinder Crusher / Mortar and Pestle. Do not make a fine powder. Heat Oil in a non-stick pan over medium flame. When the oil is slightly hot, add Cumin Seeds and ground spices, sauté for about 30 seconds. Add Red Chilli Powder and Turmeric Powder, mix well. Now add boiled Potato cubes, Salt, Fresh Coriander and mix well all the ingredients. Add Lemon Juice, Cover with lid and cook for 2 minutes. After 2 minutes, switch off the gas. Add Chat Masala, some more fresh Coriander leaves and mix well. Serve hot Jeera Aloo Sabzi with Roti, Puri or Bread.